This study is to investigate the effect of a Farnesyl Transferase Inhibitor (FTI) R115777 on apoptosis of mouse insulinoma pancreatic β cells. MTT assay was used to investigate the proliferative inhibition of in vitro cultured mouse insulinoma pancreatic β cell lines by a FTI R115777. The morphological changes of the cells were observed using a fluorescence microscope by staining with Hoechst 33258 and propidium iodide after the treatment with FTI R115777. The apoptosis rate of R115777-treated beta-TC-6 cells was detected by flow cytometry. The expressions of caspase-3 and caspase-9 of the R115777-treated beta- TC-6 cells were assayed by spectrophotometry. In addition, the sub-cellular distribution of cytochrome c and the expressions of Bax and Bcl-2 proteins were detected by Western blot. After the treatment with FTI R115777, the proliferation of the mouse insulinoma pancreatic β cell lines was significantly inhibited. Significant apoptosis was observed in the treated beta-TC-6 cells. The effect of R115777 on the apoptosis of beta-TC-6 cells showed time- and dose-dependent manners. The expressions of caspase-3, caspase-9 and Bax in the R115777-treated beta-TC-6 cells increased, while the expression of Bcl-2 decreased. The sub-cellular distribution of cytochrome-c changed, with reduced cytochrome-c in mitochondria and increased cytochrome-c in cytoplasm. FTI R115777 can inhibit the proliferation of mouse insulinoma pancreatic β cell lines, and might induce cell apoptosis through the mitochondrionmediated pathway. R115777 could be further studied as a potential antitumor drug. Farnesyl transferase inhibitor, Insulinoma, Pancreatic β cells, Apoptosis, Caspases. Farnesyltransferase Inhibitors (FTIs) are a group of tested molecular targeted anticancer drugs, whose target molecule is Ras protein [1,2]. Ras is an important molecule in cell signaling pathway. It is modified by farnesyl after translation in order to bind to cell membranes and exert the signal transduction function . Farnesylation refers to the transfer of farnesyl to protein mediated by farnesyl transferase. FTIs can inhibit the Ras-ERK/MAPK signaling pathway, and thus inhibit the proliferation of tumor cells [4,5]. They have been widely studied in the molecular targeted treatment of cancer, and some FTIs have entered Phase I or Phase II clinical study [6,7]. Insulinoma is derived from pancreatic tumor β-cells . Tumor cells in insulinoma continuously secrete insulin, which is not regulated by blood glucose concentration, and thus causes hypoglycemia. Secretion of a large amount of insulin can cause severe clinical consequences . Due to the small volume of insulinoma, it is difficult to be located and removed by surgery.Therefore, development of non-surgical treatment is necessary [10-13]. In this study, the inhibitory effect of a farnesyl transferase inhibitor R115777 on the proliferation of insulinoma β cell lines and the potential mechanisms were investigated. It was found that R115777 could inhibit insulinoma β cell proliferation and induce cell apoptosis through the mitochondrial pathway. The results suggest that R115777 may be a potential antitumor drug for the treatment of insulinoma. Dulbecco's Modified Eagle's medium (DMEM) was purchased from Gibco Co. Ltd. (NE, USA), and supplemented with 4 mM L-glutamate, 4.5 g/L glucose and 1.5 g/L NaHCO3 prior to use. Fetal Bovine Serum (FBS) was purchased from Hangzhou Sijiqing Biological Engineering Materials Co., Ltd. (Hangzhou, China), and inactivated in 56°C water bath for 30 min prior to use. Farnesyl Transferase Inhibitor (FTI) R115777, Thiazolylblue Tetrazolium Bromide (MTT), Dimethyl Sulfoxide (DMSO), and Propidium Iodide (PI) were all purchased from Sigma Co. (MO, USA). Caspase colorimetric assay kits were purchased from Nanjing Biological Technology Co., Ltd. (Nanjing, China). All antibodies were purchased from Santa Cruz Biotechnology, Inc. (TX, USA). Beta-TC-6 mouse insulinoma pancreatic β cell line, MIN6 insulinoma cell line, and RIN-m5F mouse beta insulinoma cell line were purchased from Shanghai cell bank of Chinese Academy of Sciences (Shanghai, China). The cells were cultured in DMEM medium containing 15% FBS, 100 U/ml penicillin and 100 μg/ml streptomycin at 37°C under a humidified atmosphere containing 5% CO2. The cells were passaged every 2 to 3 d, and all experiments were performed with cells at logarithmic growth phase. The cells were seeded in 96-well plates at a concentration of 3 × 104 cells/well in DMEM medium containing 10% FBS. Culture medium was used as blank control. When cells reached 80% confluency, various concentrations of FTI R115777 (0.5 μmol/L, 1.5 μmol/L, 2.5 μmol/L and 3.5 μmol/L) were added to the wells. Six repeats were set for each concentration, and culture medium was added to the cells as negative control. After 24 h incubation, MTT (final concentration was 0.5%) was added to each well and continued to culture for 4 h. The culture medium was then discarded, 150 μL DMSO was added to each well and the plate was gently shaken for 30 min. The absorption at 490 nm (OD490) was measured using a microplate reader (Bio-RadLaboratories, Inc., CA, USA). The inhibition rate of cell proliferation was calculated using the following formula: Inhibition rate=(Mean OD negative control- Mean OD FTI)/Mean OD negative control. The inhibitory effects of the three cell lines were compared by calculating the IC50 values. The beta-TC-6 cells were seeded on a cover glass in a 6-well plate at a concentration of 6 × 105 cells/well. After 24 h of incubation, various concentrations (final concentrations were 1.5 μmol/L, 2.5 μmol/L and 3.5 μmol/L) of FTI R115777 were added to the wells, and culture medium was used as the negative control. After another 48 h incubation, the cells were stained with Hoechst 33258 and PI. The stained cells were observed using a fluorescence microscope (Olympus Co., Japan). The staining and morphological changes of the nucleus and chromatin condensation were observed. Five random views were chosen for each staining and 400 cells were counted in each view. The apoptotic cells were recorded, and the apoptosis index was calculated using the following formula: Apoptosis index=(Number of apoptosis cells/Total number of cells) × 100%. The beta-TC-6 cells were cultured in a 6-well plate. When the confluency reached 80%, the FTI R115777 (final concentrations were 1.5 μmol/L, 2.5 μmol/L and 3.5 μmol/L) was added to each well and continued to incubate for 24 and 48 h. At each time point, 106 cells were collected and centrifuged at 1200 r/min for 6 min. The medium was discarded and the pellet was washed with 3 ml PBS once. After centrifugation, pre-cooled 70% alcohol were added to the cells and fixed them at 4°C for 1 h. After removing the fixative solution by centrifugation, 3 ml PBS was added to re-suspend the cells. After filtration through 400-mesh nylon net, the cells were centrifuged at 1000 r/min for 3 min, and the supernatant was discarded. Then, 1 ml PI was added to the cells and stained in the dark at 4°C for 30 min. The cells were detected by a flow cytometer (CyFlow® Cube, SysmexPartec GmbH, Am Flugplatz 13, 02828 Gorlitz, Germany) at an excitation wavelength 488 nm and an emission wavelength over 630 nm. The average of three measurements was used to calculate cell apoptosis rate. The beta-TC-6 cells were treated with 2.5 μmol/L FTI R115777 for 24 h, and then collected and washed with PBS three times. The cell suspension (2 × 106 cells/L) was treated with pre-cooled lysis buffer in an ice bath for 30 min. During the treatment, the suspension was gently shaken 3 times for 10 s each. Then the cell suspension was centrifuged under 4°C at 12000 rpm for 15 min, and the supernatant was transferred to a new centrifuge tube. The activities of caspase-3 and caspase-9 were determined according to the instruction of the colorimetric kit. The absorption at 490 nm (OD490) was measured. Beta-TC-6 cells were treated with FTI R11577 (final concentrations of 1.5 μmol/L, 2.5 μmol/L and 3.5 μmol/L) for 24 h and then collected to make single cell suspension. The cells were washed with pre-cooled PBS 3 times and broken with a homogenizer in an ice bath for 5 min. The solution was centrifuged at 1500 r/min for 10 min. The supernatant was collected and centrifuged at 10000 r/min for 30 min. At this time, the supernatant was the cytoplasmic component free of cell nuclei and mitochondria, and the precipitate was mitochondria. The precipitate was re-suspended with mitochondrial extraction buffer and vortexed for 10 s. The protein content was determined by Coomassie blue. The extracted proteins were separated by SDS-PAGE with a loading of 40 μg protein. The proteins were then electronically transferred onto a PVDF membrane and blocked with 5% skimmed milk for 1 h. After washed with PBS 3 times, rabbit anti-mouse anti-cytochrome c monoclonal antibody was added and incubated at 4°C overnight. Then, the membrane was washed with PBS for 3 times and incubated with HPR-labeled goat anti-rabbit antibody for 1 h at room temperature. After washing, coloring reagent was added to observe the bands. Mitochondrial protein Voltage-Dependent Anion Channels (VDAC) and cytoplasmic protein β-actin were used as the internal standards. The untreated beta-TC-6 cells were used as the negative control. To determine the expressions of Bax and Bcl-2, 2.5 μmol/ LR115777 treated beta-TC-6 cells were collected at 12, 24, 48 and 72 h. The total proteins were extracted after the cells were lyzed by sonication. After determining the protein content by Coomassie blue, the proteins were separated by SDS-PAGE. The proteins were then electronically transferred onto a PVDF membrane and blocked with 5% skimmed milk for 1 hour. After washed 3 times, the membranes were incubated with rabbit anti-mouse Bax and rabbit anti-mouse Bcl-2 antibodies, respectively, at 4°C overnight. After washed for another 3 times, HPR-labeled goat anti-rabbit antibody was incubated for 1 h at room temperature. After washing, coloring reagent was added to observe the bands. β-actin was used as the internal standard, and the untreated beta-TC-6 cells were used as the negative control. The statistical analysis was performed with the statistical software SPSS 17.0. The data was expressed as mean ± Standard Deviation (SD). The t-test was used for comparisons between two groups, while Analysis of Variance (ANOVA) was used for comparison among multiple groups. A P<0.05 was considered as statistically significant. To determine the effect of FTI R115777 on the proliferation of three insulinoma β cell lines (beta-TC-6, MIN6 and RIN-m5F), MTT assay was performed. The results indicated that R115777 had obvious inhibition on the proliferation of these cells and showed dose- and time-dependent manners (Table 1). And, there was significant difference between treatment groups and control group, between different doses, and between different time points. The IC50 values of R115777 on these three cell lines were calculated and showed no significant difference (P>0.05) (Figure 1). These results indicate that R115777 is an effective inhibitor on the proliferation of insulinoma β cells. Note: aCompared to the control, P<0.01; bCompared to the previous concentration, P<0.01; cComparison to 24 h, P<0.05. Table 1. 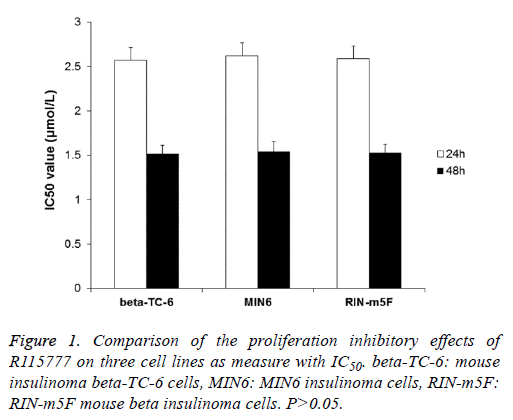 The inhibitory rates of farnesyl transferase inhibitor R115777 on mouse insulinoma cell lines beta-TC-6, MIN6 and RIN-m5F. Figure 1: Comparison of the proliferation inhibitory effects of R115777 on three cell lines as measure with IC50. beta-TC-6: mouse insulinoma beta-TC-6 cells, MIN6: MIN6 insulinoma cells, RIN-m5F: RIN-m5F mouse beta insulinoma cells. P>0.05. After treatment with R115777 for 48 h, the beta-TC-6 cells were stained with Hoechst 33258 and PI. Under the fluorescence microscope, it can be observed that cell nucleus shrunk, with irregular shape and uneven dyeing, which are typical morphological changes of apoptotic cells. On the contrary, the cells in the control group had regular shapes and large round nuclear (Figure 2). The apoptosis index was calculated. As shown in Table 2, the apoptosis index in R115777 group at each time point was significantly higher than that in the control group (P<0.05). These results indicate that R115777 can induce apoptosis of beta-TC-6 cells. Figure 2: Morphological changes of R115777-treated beta-TC-6 cells. 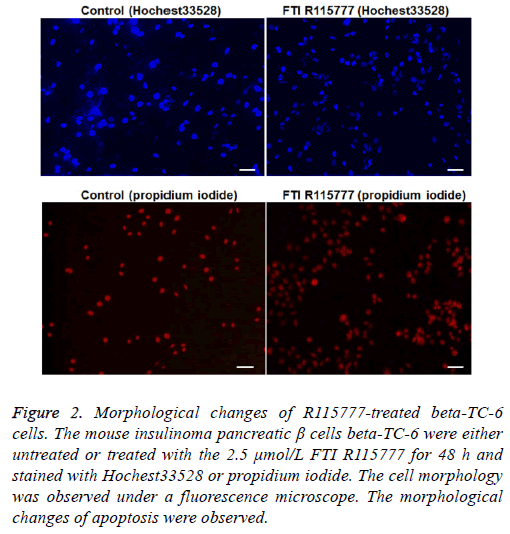 The mouse insulinoma pancreatic β cells beta-TC-6 were either untreated or treated with the 2.5 μmol/L FTI R115777 for 48 h and stained with Hochest33528 or propidium iodide. The cell morphology was observed under a fluorescence microscope. The morphological changes of apoptosis were observed. Note: aCompared to the control group, P<0.05; bCompared to the previous concentration, P<0.05. Table 2. The apoptosis index of beta-TC-6 treated with R115777 determined using a fluorescence microscope. After treating the cells with different concentrations (1.5 μmol/L, 2.5 μmol/L and 3.5 μmol/L) of FTI R115777 for different time (24 h, 48 h and 72 h), the cells were stained with PI and analysed using a flow cytometer. The results found that there was significant difference between the FTI R115777 treated groups and the control group (P<0.01). The cell apoptosis rate increased with the drug concentration and treatment time, and there were statistical significance (P<0.05) (Table 3). These results indicate that R115777 increases the apoptosis rate of beta-TC-6 cells in a concentration and time dependent manner. Note: aCompared to the previous concentration, P<0.05; bCompared to the previous time point, P<0.05; cComparison between the R115777 and control groups, P<0.01. Table 3. The apoptosis rate of beta-TC-6 treated with R115777 determined by flow cytometry. 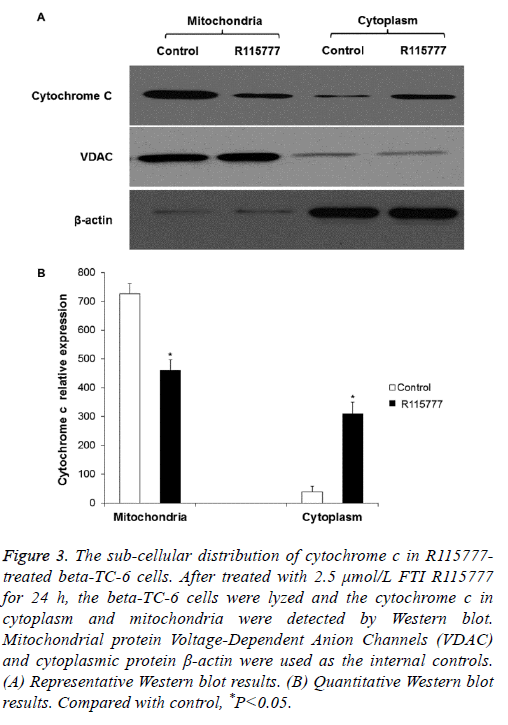 To determine if R115777 induces cell apoptosis by enhancing the permeability of mitochondrial membrane and the release of cytochrome c, Western blot was performed. As shown in Figures 3A and 3B, there was cytochrome c in the mitochondria of the control group, while it was barely detected in the cytoplasm. After treatment with 2.5 μmol/L R115777 for 24 h, the level of cytochrome c in the mitochondria declined and showed significantly difference from the control group. On the contrary, the cytochrome c level in the cytosol significantly increased. These results indicate that R115777 may induce the release of cytochrome c from mitochondria to promote cell apoptosis. Figure 3: The sub-cellular distribution of cytochrome c in R115777- treated beta-TC-6 cells. After treated with 2.5 μmol/L FTI R115777 for 24 h, the beta-TC-6 cells were lyzed and the cytochrome c in cytoplasm and mitochondria were detected by Western blot. Mitochondrial protein Voltage-Dependent Anion Channels (VDAC) and cytoplasmic protein β-actin were used as the internal controls. (A) Representative Western blot results. (B) Quantitative Western blot results. Compared with control, *P<0.05. To determine the expressions of caspase-3 and caspase-9 in the R115777-treated beta-TC-6 cells, the cells were lysed and the enzyme activities were tested by spectrophotometry. After treatment with 2.5 μmol/L R115777, the expression of caspase-3 in the drug-treated cells was about 2.35 folds of that in the control group, and the expression of caspase-9 in the drug-treated cells was about 1.57 folds of that in the control group (P<0.05) (Figure 4). These results indicate that caspase-3 and caspase-9 are activated after the beta-TC-6 cells were treated with R115777. Figure 4: The expressions of (A) caspase-3 and (B) caspase-9 in 2.5 μmol/L R115777-treated beta-TC-6 cells. After treated with 2.5μmol/L FTI R115777 for 24 h, the beta-TC-6 cells were lyzed and the activities of caspase-3 and caspase-9 were determined using colorimetric kits. Obvious increase of the activities of caspase-3 and caspase-9 were found after treatment with R115777. *P<0.01 vs. blank; **P<0.01 vs. control. To determine the expression levels of Bax and Bcl-2, Western blot was performed. After treatment with 2.5 μmol/L R115777 for different time, the expression of Bax protein increased compared to the control group, while the expression of Bcl-2 decreased (Figures 5A and 5B). Both Bax and Bcl-2 expressions showed obvious time-dependent changes. These results indicate that R115777 may increase Bax expression and decrease Bcl-2 expression to promote cell apoptosis. 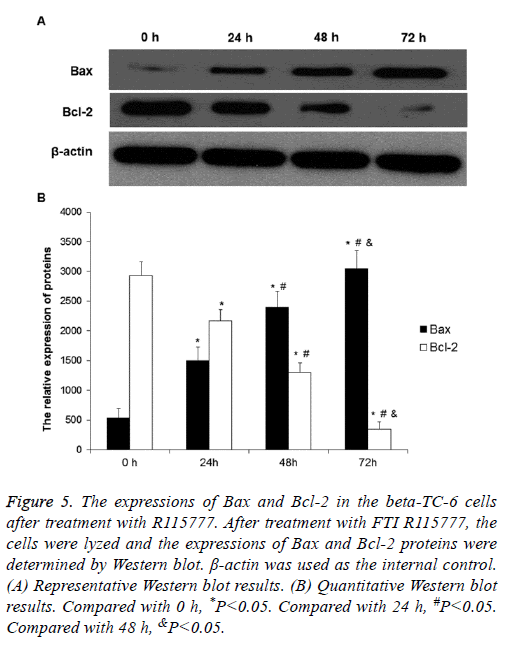 Figure 5: The expressions of Bax and Bcl-2 in the beta-TC-6 cells after treatment with R115777. After treatment with FTI R115777, the cells were lyzed and the expressions of Bax and Bcl-2 proteins were determined by Western blot. β-actin was used as the internal control. (A) Representative Western blot results. (B) Quantitative Western blot results. Compared with 0 h, *P<0.05. Compared with 24 h, #P<0.05. Compared with 48 h, &P<0.05. Insulinoma, also known as islet β-cell tumor, is one of the most common islet tumors, accounting for 70-75% of islet cell tumors . Insulinoma is characterized by recurrent fasting hypoglycemia, which is a common cause of organic hypoglycemia . About 83% of insulinoma is benign pancreatic β cell tumor, about 7% is β-cell hyperplasia, and less than 10% is malignant. Approximately 91.4% of insulinoma is solitary. The tumor is generally small and 82% of them have a tumor diameter of 1-2.5 cm [11,12]. Although the tumor is small, the unregulated insulin secretion can cause severe clinical consequences, such as hypoglycemia . Insulin is secreted by islet β cells via “membrane fusion” and “kiss-and-run” modes [14,15]. Under normal circumstances, insulin secretion is regulated by negative feedback of blood glucose concentration. When blood glucose level decreases, the secretion of insulin is inhibited. When blood glucose concentration declines to 1.94 mmol/L, the secretion of insulin almost completely stops. However, in insulinoma, such physiological feedback mechanism is completely lost. The tumor cells continuously secrete insulin and are not regulated by blood glucose concentration, resulting in hypoglycemia . The metabolic activity of human brain cells only relies on glucose, but not glycogen, to provide energy, therefore, repeated hypoglycemia can cause serious damage to the central nervous system. Since insulinoma generally has a small tumor volume, it is difficult for clinical diagnosis, which further leads to the difficulties of surgical resection. Therefore, it is necessary to develop non-surgical method for the treatment of insulinoma [10-13]. FTIs are a kind of anticancer reagents targeting tumor cell signal transduction pathways [17,18]. They can inhibit the farnesylation of many proteins including Ras to exert the antitumor effect . Several FTIs are under investigation or development, of which R115777 (Zarnestra, Tipifarnib) has received more attention [19-21]. A few FTIs including R115777 have entered clinical study (phases I-III) with certain positive results in the treatment of leukemia and breast cancer, and some of them are used in combination with other therapeutic agents [22-28]. R115777 has been shown to inhibit farnesyl transferase and therefore the kappa B-Ras peptide. It has also been shown to increase apoptosis in some cancerous cell lines [29,30]. Cell apoptosis is gene regulated programmed cell death. The execution of cell apoptosis mainly depends on the activation of caspase-3 and hydrolysis activation of a variety of proteases and nucleases, while the initiation and regulation of cell apoptosis are regulated by many factors, including Bak, Bax and Bcl-2 in the Bcl-2 family, caspase-8 and caspase-9 in the caspase family and survivin in the apoptosis inhibitor family [31,32]. The initiation of cell apoptosis has two pathways, the intrinsic and extrinsic pathways. The intrinsic apoptosis pathway is also called mitochondrial pathway or cytochrome c mediated pathway. Many studies have demonstrated that mitochondria play important roles in cell apoptosis [33,34]. Although there is no obvious morphological change for mitochondria, some channels on mitochondrial membranes are open during the process of cell apoptosis. Hence, cytochrome c and SMAC (second mitochondria-derived activator of caspases) in mitochondria will enter cytoplasm during apoptosis. The key step of cell apoptosis is the release of cytochrome c, which can bind to Apoptotic Protease Activating Factor-1 (Apaf-1) in cytosol in the presence of dATP to make it form multimers. The multimer then binds to caspase-9 to activate it and further activate other caspases like caspase-3 to induce cell apoptosis. In addition, mitochondria can release Apoptosis Inducing Factors (AIFs), which are involved in the activation of caspases [35,36]. Thus, the respective components of apoptotic bodies present in different parts of normal cells. Pro-apoptotic factors can induce the release of cytochrome c and formation of apoptotic bodies. Obviously, the key question for the molecular mechanism of apoptosis is the regulation of cytochrome c release from mitochondria. Most apoptosisstimulating factors activate cell apoptosis through mitochondria. Some researchers believe that receptor-mediated apoptotic pathway also causes cytochrome c release from mitochondria. For example, in Fas-responsive cells, type 1 cells containing enough caspase-8 can be activated by death receptors and lead to cell apoptosis. In this type of cells, the highly expressed Bcl-2 cannot inhibit Fas-induced cell apoptosis. In type 2 cells like hepatocytes, Fas receptor mediated caspase-8 activation cannot reach high levels. Therefore, the cell apoptosis signal needs the mitochondrial pathway to enlarge. Bid, a Bcl-2 family protein containing only BH3 domain, is a messenger that can pass apoptotic signal from caspase-8 to mitochondria [37-39]. In this study, it was found that R115777 could obviously inhibit the proliferation and induce apoptosis of beta-TC-6. Its inhibitory effects among three mouse β cell lines did not show significant differences. The expressions of caspase-3, When using drugs to induce cell death, it must be taken into consideration about the possibility that the sudden death of a large amount of insulinoma cells in a patient might release too much insulin and cause fatal hypoglycemia [40-46]. However, this may not be a problem for R115777 therapy because it induces tumor cell apoptosis and the apoptotic cells or apoptotic bodies are engulfed by macrophages through phagocytosis and the insulin inside the dead cells/bodies will most possibly be degraded by the lysosomal enzymes of the macrophages [47-50]. In addition, if the drug could be used clinically, the patients should be administered with glucose or other medications to prevent any possible hypoglycemia. Moreover, animal experiments and clinical trials will be performed to ensure the safety of R115777 in the treatment of insulinoma . The work was supported by Education Department of Shaanxi Province (15JK1810), National Natural Science Foundation of China (81760732), Shaanxi Health and Family Planing Commission (2016D074), and Yan'an Science and Teahnolgy Bureau (2016KS-10). Brock EJ, Ji K, Reiners JJ, Mattingly RR. How to Target Activated Ras Proteins: Direct Inhibition vs. Induced Mislocalization. Mini Rev Med Chem 2016; 16: 358-369. Agrawal AG, Somani RR. Farnesyltransferase inhibitor as anticancer agent. Mini Rev Med Chem 2009; 9: 638-652. Hobbs GA, Der CJ, Rossman KL. RAS isoforms and mutations in cancer at a glance. J Cell Sci 2016; 129: 1287-1292. Zhang J, Jiang H, Xie L, Hu J, Li L, Yang M, Cheng L, Liu B, Qian X. Antitumor effect of manumycin on colorectal cancer cells by increasing the reactive oxygen species production and blocking PI3K-AKT pathway. Onco Targets Ther 2016; 9: 2885-2895. Hong DS, Cabanillas ME, Wheler J, Naing A, Tsimberidou AM, Ye L, Busaidy NL, Waguespack SG, Hernandez M, El Naggar AK, Bidyasar S, Wright J, Sherman SI, Kurzrock R. Inhibition of the Ras/Raf/MEK/ERK and RET kinase pathways with the combination of the multikinase inhibitor sorafenib and the farnesyltransferase inhibitor tipifarnib in medullary and differentiated thyroid malignancies. J Clin Endocrinol Metab 2011; 96: 997-1005. Lancet JE, Duong VH, Winton EF, Stuart RK, Burton M, Zhang S. A phase I clinical-pharmacodynamic study of the farnesyltransferase inhibitor tipifarnib in combination with the proteasome inhibitor bortezomib in advanced acute leukemias. Clin Cancer Res 2011; 17: 1140-1146. Witzig TE, Tang H, Micallef IN, Ansell SM, Link BK, Inwards DJ. Multi-institutional phase 2 study of the farnesyltransferase inhibitor tipifarnib (R115777) in patients with relapsed and refractory lymphomas. Blood 2011; 118: 4882-4889. Vanderveen K, Grant C. Insulinoma. Cancer Treat Res 2010; 153:235-252. Shin JJ, Gorden P, Libutti SK. Insulinoma: pathophysiology, localization and management. Future Oncol 2010; 6: 229-237. Kandouli C, Cassien M, Mercier A, Delehedde C, Ricquebourg E, Stocker P, Mekaouche M, Leulmi Z, Mechakra A, Thetiot-Laurent S, Culcasi M, Pietri S. Antidiabetic, antioxidant and anti-inflammatory properties of water and n-butanol soluble extracts from Saharian Anvillea radiata in high-fat-diet fed mice. J Ethnopharmacol 2017; 207: 251-267. Li XH, Zhang JL, Liu YF. Localization of small sized insulinoma by means of combining arteriography with CT: a case report and review of the literature. Hepatogastroenterology 2010; 57: 1579-1583. Mehrabi A, Fischer L, Hafezi M, Dirlewanger A, Grenacher L, Diener MK, Fonouni H, Golriz M, Garoussi C, Fard N, Rahbari NN, Werner J, Büchler MW. A systematic review of localization, surgical treatment options, and outcome of insulinoma. Pancreas 2014; 43: 675-686. Mulla CM, Storino A, Yee EU, Lautz D, Sawnhey MS, Moser AJ, Patti ME. Insulinoma after bariatric surgery: diagnostic dilemma and therapeutic approaches. Obes Surg 2016; 26: 874-881. Poitout V, Stout LE, Armstrong MB, Walseth TF, Sorenson RL, Robertson RP. Morphological and functional characterization of beta TC-6 cells-an insulin-secreting cell line derived from transgenic mice. Diabetes 1995; 44: 306-313. Fu ZY, Wang YP, Chen Y. Observation of insulin exocytosis by a pancreatic β cell line with total internal reflection fluorescence microscopy. Chinese Med Sci J 2011; 26: 49-52. Vaidakis D, Karoubalis J, Pappa T, Piaditis G, Zografos GN. Pancreatic insulinoma: current issues and trends. Hepatobiliary Pancreat Dis Int 2010; 9: 234-241. Moorthy NS, Sousa SF, Ramos MJ, Fernandes PA. Molecular dynamic simulations and structure-based pharmacophore development for farnesyltransferase inhibitors discovery. J Enzyme Inhib Med Chem 2016; 18: 1-15. Sharma V, Shaheen SS, Dixit D, Sen E. Farnesyltransferase inhibitor manumycin targets IL1β-Ras-HIF-1α axis in tumor cells of diverse origin. Inflammation 2012; 35: 516-519. Jin Y, Li L, Yang Z, Liu M, Guo H, Shen W. The discovery of a novel compound with potent antitumor activity: virtual screening, synthesis, biological evaluation and preliminary mechanism study. Oncotarget 2017; 8: 24635-24643. Ha YR, Hwang BG, Hong Y, Yang HW, Lee SJ. Effect of farnesyltransferase inhibitor R115777 on mitochondria of Plasmodium falciparum. Korean J Parasitol 2015; 53: 421-430. Tanaka T, Ikegami Y, Nakazawa H, Kuriyama N, Oki M, Hanai J, Sukhatme VP, Kaneki M. Low-dose farnesyltransferase inhibitor suppresses HIF-1α and snail expression in triple-negative breast cancer MDA-MB-231 cells in vitro. J Cell Physiol 2017; 232: 192-201. Desjardins A, Reardon DA, Peters KB, Threatt S, Coan AD, Herndon JE, Friedman AH, Friedman HS, Vredenburgh JJ. A phase I trial of the farnesyl transferase inhibitor, SCH 66336, with temozolomide for patients with malignant glioma. J Neurooncol 2011; 105: 601-606. Widemann BC, Arceci RJ, Jayaprakash N, Fox E, Zannikos P, Goodspeed W, Goodwin A, Wright JJ, Blaney SM, Adamson PC, Balis FM. Phase 1 trial and pharmacokinetic study of the farnesyl transferase inhibitor tipifarnib in children and adolescents with refractory leukemias: a report from the Childrens Oncology Group. Pediatr Blood Cancer 2011; 56: 226-233. Gajewski TF, Salama AK, Niedzwiecki D, Johnson J, Linette G, Bucher C, Blaskovich MA, Sebti SM, Haluska F, Cancer and Leukemia Group B. Phase II study of the farnesyltransferase inhibitor R115777 in advanced melanoma (CALGB 500104). J Transl Med 2012; 10: 246. Rich TA, Winter K, Safran H, Hoffman JP, Erickson B, Anne PR, Myerson RJ, Cline-Burkhardt VJ, Perez K, Willett C. Weekly paclitaxel, gemcitabine, and external irradiation followed by randomized farnesyl transferase inhibitor R115777 for locally advanced pancreatic cancer. Onco Targets Ther 2012; 5: 161-170. Milojkovic Kerklaan B, Dieras V, Le Tourneau C, Mergui-Roelvink M, Huitema AD, Rosing H, Beijnen JH, Marreaud S, Govaerts AS, Piccart-Gebhart MJ, Schellens JH, Awada A. Phase I study of lonafarnib (SCH66336) in combination with trastuzumab plus paclitaxel in Her2/neu overexpressing breast cancer: EORTC study 16023. Cancer Chemother Pharmacol 2013; 71: 53-62. Andreopoulou E, Vigoda IS, Valero V, Hershman DL, Raptis G, Vahdat LT, Han HS, Wright JJ, Pellegrino CM, Cristofanilli M, Alvarez RH, Fehn K, Fineberg S, Sparano JA. Phase I-II study of the farnesyl transferase inhibitor tipifarnib plus sequential weekly paclitaxel and doxorubicin-cyclophosphamide in HER2/neu-negative inflammatory carcinoma and non-inflammatory estrogen receptor-positive breast carcinoma. Breast Cancer Res Treat 2013; 141: 429-435. Stieglitz E, Ward AF, Gerbing RB, Alonzo TA, Arceci RJ, Liu YL, Emanuel PD, Widemann BC, Cheng JW, Jayaprakash N, Balis FM, Castleberry RP, Bunin NJ, Loh ML, Cooper TM. Phase II/III trial of a pre-transplant farnesyl transferase inhibitor in juvenile myelomonocytic leukemia: a report from the Childrens Oncology Group. Pediatr Blood Cancer 2015; 62: 629-636. Asati V, Mahapatra DK, Bharti SK. K-Ras and its inhibitors towards personalized cancer treatment: Pharmacological and structural perspectives. Eur J Med Chem 2017; 125: 299-314. Giudice V, Ricci P, Marino L, Rocco M, Villani G, Langella M, Manente L, Seneca E, Ferrara I, Pezzullo L, Serio B, Selleri C. In vitro apoptotic effects of farnesyltransferase blockade in acute myeloid leukemia cells. Transl Med UniSa 2016; 15: 22-33. Gao F, Fu Z, Tian H, He Z. The euphorbia lunulata bge extract inhibits proliferation of human hepatoma HepG2 cells and induces apoptosis. J Buon 2013; 18: 491-495. Fu ZY, Han XD, Wang AH, Liu XB. Apoptosis of human gastric carcinoma cells induced by Euphorbia esula latex. World J Gastroenterol 2016; 22: 3564-3572. Kong GM, Tao WH, Diao YL, Fang PH, Wang JJ, Bo P, Qian F. Melittin induces human gastric cancer cell apoptosis via activation of mitochondrial pathway. World J Gastroenterol 2016; 22: 3186-3195. Fu Z, Han X, Du J, Han X, Liu W, Shao S, Liu X. Euphorbia lunulata extract acts on multidrug resistant gastric cancer cells to inhibit cell proliferation, migration and invasion, arrest cell cycle progression, and induce apoptosis. J Ethnopharmacol 2017. Huang GM, Sun Y, Ge X, Wan X, Li CB. Gambogic acid induces apoptosis and inhibits colorectal tumor growth via mitochondrial pathways. World J Gastroenterol 2015; 21: 6194-6205. Pham HHT, Seong YA, Ngabire D, Oh CW, Kim GD. Cyperus amuricus induces G1 arrest and apoptosis through endoplasmic reticulum stress and mitochondrial signaling in human hepatocellular carcinoma Hep3B cells. J Ethnopharmacol 2017; 208: 157-164. Ueda N. Ceramide-induced apoptosis in renal tubular cells: a role of mitochondria and sphingosine-1-phoshate. Int J Mol Sci 2015; 16: 5076-5124. Lin YY, Lee IY, Huang WS, Lin YS, Kuan FC, Shu LH, Cheng YC, Yang YH, Wu CY. Danshen improves survival of patients with colon cancer and dihydroisotanshinone I inhibit the proliferation of colon cancer cells via apoptosis and skp2 signaling pathway. J Ethnopharmacol 2017; 209: 305-316. TeSlaa T, Setoguchi K, Teitell MA. Mitochondria in human pluripotent stem cell apoptosis. Semin Cell Dev Biol 2016; 52: 76-83. Okabayashi T, Shima Y, Sumiyoshi T, Kozuki A, Ito S, Ogawa Y, Kobayashi M, Hanazaki K. Diagnosis and management of insulinoma. World J Gastroenterol 2013; 19: 829-837. Matej A, Bujwid H, Wroński J. Glycemic control in patients with insulinoma. Hormones (Athens) 2016; 15: 489-499. Simo-Servat A, Perez Maraver M, Puig de la Bellacasa Suils J. Postprandial hypoglycemia as the only manifestation of insulinoma: exceptional case report. Med Clin (Barc) 2017; 149: 133-134. Tomazic M, Janez A, Ravnik Oblak M. Hypoglycemia identified by a continuous glucose monitoring system in a second-trimester pregnant woman with insulinoma: a case report. J Med Case Rep 2017; 11: 117. Gjelberg HK, Hoem D, Verbeke CS, Eide J, Cooper JG, Molven A. Hypoglycemia and decreased insulin requirement caused by malignant insulinoma in a type 1 diabetic patient: when the hoof beats are from a zebra, not a horse. Clin Case Rep 2017; 5: 761-768. Li X, Yu H, Yin J, Li L, Zhou J, Li M, Li Q, Chen H, Liu F, Bao Y, Han J, Jia W. Decreased levels of fibroblast growth factor 21 are correlated with improved hypoglycemia in patients with insulinoma. Sci Rep 2017; 7: 43123. Saneifard H, Khaleghnejad Tabari A, Kazemi Aghdam M, Musavi Khorshidi M, Sheikhy A. Sporadic insulinoma as a rare cause of recurrent hypoglycemia in children. Case Rep Pediatr 2017; 2017: 4756793. Martin KR, Ohayon D, Witko-Sarsat V. Promoting apoptosis of neutrophils and phagocytosis by macrophages: novel strategies in the resolution of inflammation. Swiss Med Wkly 2015; 145: 14056. Sugimoto MA, Vago JP, Teixeira MM, Sousa LP. Annexin A1 and the Resolution of Inflammation: Modulation of Neutrophil Recruitment, Apoptosis, and Clearance. J Immunol Res 2016; 2016: 8239258. Liu C, Jiang S, Wang M, Wang L, Chen H, Xu J, Lv Z, Song L. A novel siglec (CgSiglec-1) from the Pacific oyster (Crassostrea gigas) with broad recognition spectrum and inhibitory activity to apoptosis, phagocytosis and cytokine release. Dev Comp Immunol 2016; 61: 136-144. Becker M, Müller CB, De Bastiani MA, Klamt F. The prognostic impact of tumor-associated macrophages and intra-tumoral apoptosis in non-small cell lung cancer. Histol Histopathol 2014; 29: 21-31. Kanno A, Ide K, Kurita K, Terano T, Yamamoto K. Octreotide LAR was useful for avoiding hypoglycemia in an elderly patient with insulinoma. Nihon Ronen Igakkai Zasshi 2017; 54: 172-178.